Containing 11 000 acres. Commencing at the north-east corner of G F Leslie’s pre-purchase of 164 acres on Canning Downs, and bounded thence on the west by a line bearing north to Campbell’s Gully upwards to a point quarter of a mile easterly from the well at the Well Station, thence by a line bearing north one mile, thence by a line bearing north-east to Freestone Creek, upwards to the fence of Deuchar’s paddock, thence by the fence of that paddock easterly and south-easterly to a point bearing north from the head of J. Smith’s Gully, on the east by a line bearing south to the head of J. Smith’s Gully, thence by Swan Creek downwards to a point bearing east from the north-east corner of G F Leslie’s 164 acres to the point of commencement. Given by my Hand, and the Seal of the Colony at Government House, Brisbane, this thirteenth day of March, in the year of Our Lord, One thousand eight hundred and sixty one, and in the twenty-fourth year of Her Majesty’s Reign. The above is as it appears in the 1861 Queensland Government gazette on page 167. Pioneer home of David and Catherine Payne. Settlers very quickly applied for land and the first settler to arrive here was Henry Smith, farming for many years in an area which became known as Smiths corner. Smiths also grew an extensive orchard, with a lot of grapes, pears and china peaches. Henry Smith and his wife Elizabeth arrived in Moreton Bay on the 18th September 1858, with two children. They eventually arrived in Warwick, and moved to Freestone in 1862. They were joined by Henry’s sister-in-law, Mrs Mary Cox and her husband Charles and their children. Other families quickly followed the Smiths. The descendants of many of the early pioneering families still reside at Freestone. By the end of the decade, the district was well established. Settlers from many difference countries made their way to Freestone. Some came from England, Ireland, the Scandanavian countries and Germany. Some of the early families were the Smiths, Cox, Palmer, Payne, Ryan, O’Dempsey, Christensen, Craig, and Wilson, to name a few. The sketch (left) on the cover of this book is of "Clavering", built on a selection of land adjacent to Campbell’s Gully and Freestone Road, and was built sometime prior to 1865 - note the detached kitchen in case of fire. The house was owned by Robert Craig and his wife Ann. Two of their Grandchildren, now Grandparents themselves, still live in the immediate area. They are Mr Charlie Briggs and Mrs Alice Gillespie. The sketch of "Clavering" is by Allora artist, Mr Mark Brelford, and is printed with his permission. It is interesting to note that some of the early settlers named their properties after their home town or district in their home land. Eg. the Craigs named their property "Clavering" after Clavering in England, while the O’Dempsey family named their property "Tipperary Valley" after their Irish homeland. Life was certainly not easy for the early settlers, fighting the elements and working the land with horse drawn implements or by hand. The first wheat crop grown in the area was grown by Jimmy Wilson, on 6 acres of land opposite the school, which would have been sown by hand and cut with a reaping hook and bound by it’s own straw. The Wilson family owned a very large house of some 28 rooms. Unfortunately the house was destroyed by fire. Two of the Wilson’s sons were drowned in Freestone Creek, and they are buried near the creek, below the school. Many stories are told of one family helping another in times of difficulty, as well as in the good times. Christmas meals were sent to those less fortunate than themselves while other families already settled here were opening their homes to the new comers. One such family was the Kirkegaard family, whose ancestors had come from the Scandanavian countries of Denmark and Sweden, and had taken up property at Freestone, known as "Marydale". Many people from these countries were befriended by Mr Tinus Kirkegaard and his family, and assisted to settle into their new life on the Darling Downs. Tinus Kirkegaard was also active in establishing the Warwick Farmers Milking Association. Tinus and Maria Kirkegaard 1892. He was a foundation member of the State Wheat Board and its representative on the Queensland Council of Agriculture. In 1870, on August the first, Freestone had its first school. The first being named Freestone Creek Lower. A few years later, in 1874, on the 19th of October, a second school began, known as Freestone Creek Upper. The year 1900 saw the Freestone School of Arts built, and this became a popular social meeting place for the residents. Transport was not as easy as it is today and many people walked from place to place. Picnics and dances were popular forms of entertainment. In 1908, a Freestone Farmer, Mr Harold Hall imported and two and a half inch refracting telescope from England. He was an observer of various phenomena and set up mounting, for use during the solar eclipse in 1922. The telescope is still in the possession of the Hall Family. With the building of the railway in 1910 and 1911, the township of Freestone began to grow. Blocks of land sold for around 29 pounds in 1911. Glengallan Station was broken up for settlement in 1912 and farms on the south eastern boundary of Glengallan Station became part of Freestone. In 1912, land was selling for around 6 pounds per acre at East Glengallan. 1914 saw young men from Freestone enlisting in the Army to fight for King and Country. On January 4th 1919, a severe hail storm causing much damage swept through the area. After World War 1, around the 1920’s the township of Freestone really boomed. The town boasted Churches, store, railway station, post office, school, butchers, saddlers, blacksmiths, school of arts, sporting facilities and a grain shed. Upper Freestone also had a store, butchers shop, post office and a school. The Cemetry was also located at Upper Freestone. In 1922, a bad whirly wind destroyed windmills and machinery as well as stripping the ground bare, and causing one farmer’s chooks to lose all their feathers. 1923 was a very dry year, and the drought broke on Christmas Eve. During 1923, the first water bores were sunk and good water was found. With the depression years, many men started travelling around looking for work. These "swaggies" became a common sight. The depression years were difficult ones with food and petrol rationing, poor prices for grain and livestock, and banks and businesses in the towns and cities folding under the pressure of the depression. The average wheat yield during the 1930’s was 10/12 bags per acre. Draft horses were used for working the land. 1932 saw another disastrous hail storm. Occasional visits from the circus were the delight of the children. It was a time of great excitement when the tent could be seen in the paddock opposite the hall. The call of war once again saw our young men going off to serve their country, between 1939 and 1945. As in World War 1, some of these men were never to return, while others were left with the bitter memories of war. Sometime after World War II, the name of the School of Arts was changed to the Freestone School of Arts and Memorial Hall, in recognition of those who offered and those who gave their lives for their King and Country. The road system has greatly improved over the years, from a mere tract to something which resembled a road and on to what we know today. Many stories are told of vehicles becoming bogged and of tyres getting into the ruts in the road and wearing out on the sides. The roads have developed in accordance with the needs of the district. Horseback and bullock drays gave way to sulkies. Michael Christensen was the first to own a sulky in this area. The trip to Warwick would take 3/4 hour. The first mail delivered from Warwick were carried out on horseback. Jack McKinnar was one such person. He came out from Warwick, turning at Smith’s corner, dropping the mail at the post office, had a cup of tea at Hallmans, then going across the creek, turning to the right at the church of England, then going on to Gladfield via Mailman’s gap, then on to Maryvale. This was a twice weekly service, with no road side deliveries. Later the mailmen came out in utilities and left the mail at the store/post office. No mail deliveries were made within a mild of the post office. The Upper Freestone area received mail in a similar fashion. At first they were by horseback, and they were road side deliveries. Some of the mailmen were Dinny Phelan, Fred (Bangy) Lancaster and Billy Noble Snr. The mailmen also delivered milk to the Upper Freestone School at one stage. Drovers were a common sight. An entry in a diary shows 200 head camped in the back lane in 1947. Another entry in a diary shows that the school sports in 1951 were cancelled due to a polio epidemic. The rail carried cream to Warwick, but around 1937 road side cream runs were started. Jackie Hallman was one of these pick-up men and is remembered for getting bogged frequently. Percy Kirby had a fuel run as well as cream and milk run. He also carried goods from Warwick as desired. During World War II, around 1942, the Government built a cheese factory in Warwick, to help feed the troops. This was when the change was made from cream to milk and this was a significant change for all dairy farmers. Several modern dairies still operate in the district with regular collections made by the bulk mild tankers from Warwick. Transport progress saw the introduction of cars, trucks and tractors. 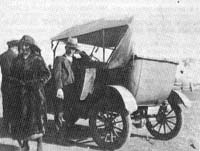 The first car in the district was owned by Charlie Cox - a "tin lizzie" Model T Ford. Ted Larsen owned one of the first tractors - an International McCormick, while Jack Hallman is said to have owned the first rubber tyred tractor during the 1940’s. The Model T truck also came to Freestone, with Noel Harwood owning one of these. Draft horse continued to be used long after the introduction of tractors, as it was the mid 1960’s before Jim and Arthur Christensen, the last men in the district to use teams, converted to tractor drawn implements. Jim says it was a sorry day indeed when they had to part with their team. He fondly remembers the teams of 10 working on his property. Jim held on to the team as long as possible as, to use his words, "He wasn’t one for engines". In 1963, the Main Roads approved the work to seal the Freestone Road. The first stage of the sealing was completed in August 1964. The first section came from Warwick, to a point just short of Ron Shelley’s place and the work was completed at a cost of 30 916 pounds. The work continued over the years to the standard we accept today. The bridge across Freestone Creek is called Palmer’s Bridge in honour of the Palmer Brothers, one of whom held the office of Deputy Chairman of the Glengallan Shire council. The 20th of February 1968, saw electricity connected to Lower Freestone, while Upper Freestone received power in March 1969. Before this, lamps were used. Many are the ladies remember having to clean the glass on these. Then came the home power plants. These came in the 1950’s, the first families to have these being the Burtons and Madsens. 1970 saw a very large crowd of over 1000 attend the Centenary of Freestone State School. January 1973 saw the introduction of party line telephone following the closure of the post office and exchange. The automatic exchange began in October of 1973. Over the years, the crops in the district have changed. Where once only wheat was grown, now a wide variety of crops are grown, with the colours in the valley continually changing as these crops grow, ripen and are harvested by an assortment of machinery which our forefathers would find hard to imagine. We must all pay tribute to the work and the courage of the early settlers who paved the way for the success that Freestone has become.